HISTORY LESSON #1: The Crypt of Terror (like most EC titles) began life as another comic book; well, actually three different comics. First as International Comics (for five issues), then morphing into International Crime Patrol for a single issue, before downsizing to the easier-to-digest Crime Patrol for a further ten numbers. 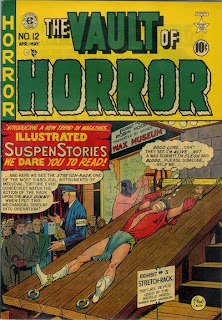 Legend has it that publisher Bill Gaines and editor Al Feldstein took notice of the horror titles at their local newsstands in 1949 and decided to give it a go. Crime Patrol #15 and #16 feature EC's first venture into horror stories (in fact, a few of them are hosted by The Crypt-Keeper and it can be argued that all 4 tales in #16 are horrific in theme) but The Crypt of Terror #17 is the first acknowledged EC horror title. You'd never know, based on the quality of the quartet included herein, that EC would soon take the comic world by storm. 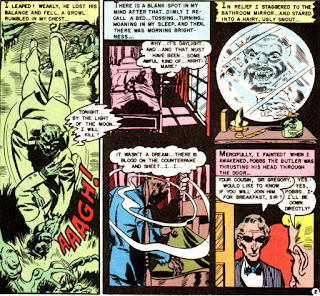 These are lukewarm imitations of some of the less-than-frightening fables found in the competition at the time and only one, "Death Must Come," features supernatural elements. Executioner Edgar Bowman becomes so obsessed with his job as state executioner that he feels robbed when a spate of murder trials end in "Not Guilty" verdicts. Bowman takes the law into his own hands and begins executing those found innocent until a crew of clever cops catches him in the act. The finale sees Edgar being ushered to the electric chair, screaming and mewling like the prisoners he once executed himself. A decent read but, like "The Corpse Nobody Knew" and "Curse of the Full Moon," a story that could have easily been produced for the Crime Patrol title. Artist Bill Fraccio later teamed with inker Tony Tallarico (under the joint pseudonyms of Tony Williamson/Tony Williamsune) to contribute several stories to the Warren mags. Jack: Maybe it's the fallout from reading too many issues of Ghosts and Unexpected, but I really enjoyed this comic! Four stories, 28 pages of comics, and art by Feldstein and Craig? Bring it on! I thought "Death Must Come" was the best story of the group. 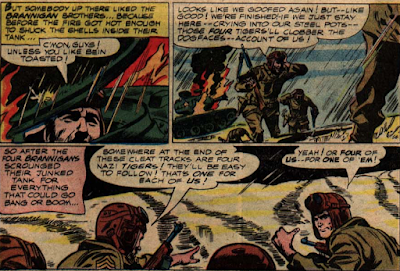 The art by Fraccio and Roussos looked like a holdover from the Golden Age to me, while Feldstein's and Craig's work seemed to point toward a New Trend. And I love the host! Jose: I may be suffering from the same desert-mania as Jack, but CoT #17 is a refreshing breeze compared to some of the mind-numbing offerings from the other pre-coders I've been reading lately. 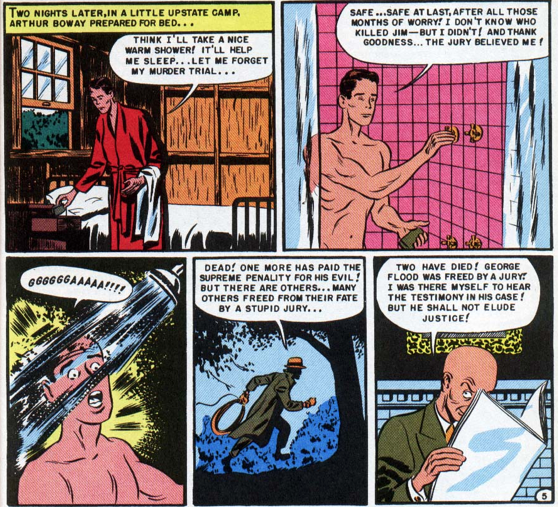 I enjoyed the madly scientific twist on Dorian Gray in “Death Must Come,” and Fraccio’s art, which didn't wow me on my first reading of “The Man Who Was Death” many moons ago, has some pretty cool subtle touches that I never fully appreciated, such as how he shadows the executioner's bald head to look like a skull, though there is a funny bit where a plainclothes detective espousing a theory in one panel takes it up in the next as a totally different uniformed officer! “Corpse” is strictly standard second-tier detective stuff, nothing remarkable or indicative of EC’s subversiveness to come. And though we may have correct suspicions about the killer in “…Full Moon,” the revelation is handled effectively and is actually rather chilling for exposing the culprit as not a creature of myth but a psychopathic killer able to rend humans to bits. Definitely spookier than Lon Chaney Jr. in the Yorkie Terrier get-up. 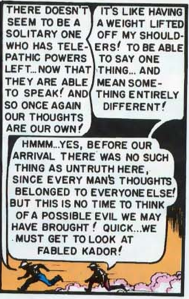 John: Coming into this free of the years of comic-boarding torture my fellow comrades have endured, I'm more in line with Peter in my assessment of this initial batch of EC Horrors. 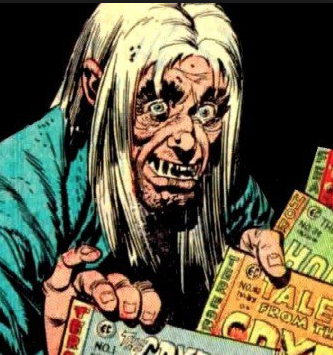 And one thing I want to know--have the 'Crypt of Terror' tales from the preceding issues of Crime Patrol been reprinted? If so, I'm somewhat shocked that Peter the completist didn't have us kick off with those stories that ultimately led to the rebirth of EC. 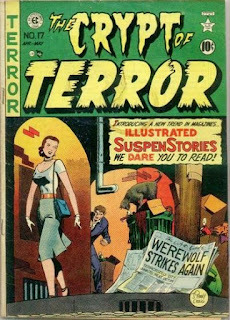 I can't bring myself to elevate any one story in this issue over the other, but my biggest disappointment (in terms of my lofty expectations not being met) had to be the near absence of the werewolf in "Curse of the Full Moon." These aren't the ground-breaking, no-holds barred EC Comics I've come to expect. But since this is just the beginning, it's only fair to cut them some slack. After a terrific cover by Johnny Craig, we get what may be our first classic story in “Portrait in Wax!” Ah, Paris! It’s the mid-1930s and, on the Left Bank, that haven for struggling artists, live two roommates: Robert, an artistic genius who cares nothing for money, and Henry, who lacks talent but loves cash. Henry starts to sell Robert’s etchings as his own but when Robert finds out and threatens to ruin him, Henry throws acid in his roommate’s face and then kills him by dumping his body in a vat of acid. Free to profit from his wrongdoing, Henry lives it up for the next few years, selling Robert’s etchings until he runs out. Just in the nick of time, he meets a brilliant sculptor and makes a proposal—Henry will sell his statues as if they are Henry’s and the sculptor will be allowed to work alone and his statues will be only of the recently dead. Henry’s life remains happy and prosperous until one day he drops a statute and discovers that it is really a corpse covered in wax. Henry confronts the sculptor and punches him, only to discover that his face is wax as well and that he is really Robert, who did not die but rather planned an elaborate scheme to get revenge on Henry. Henry dies of a heart attack and soon we see that his is the final statue to be created by the sculptor. 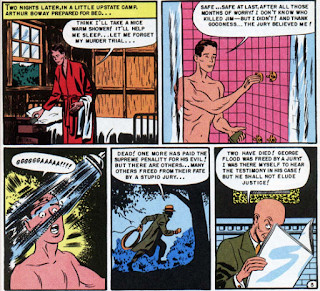 Don’t think too hard about some of the plot points in Craig’s story, such as how Henry could think he was murdering Robert by dropping him in a vat of water, as the Vault-Keeper tells us in a final panel post-script, or how keeping Henry rich and famous constitutes revenge. Just enjoy the wonderful twists and turns and the great art. The story owes a debt to Mystery of the Wax Museum but it’s a great start to this series. “The Werewolf Legend” is very similar to “Curse of the Full Moon!” from Crypt of Terror 17 (above) and has some confusing credits. 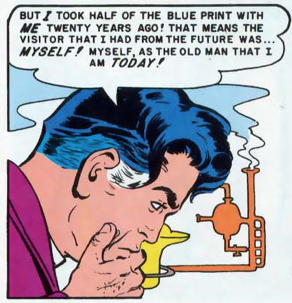 Russ Cochran writes that it’s by Harry Harrison and Wally Wood (it’s signed at the bottom of the first page), while the Grand Comics Database points out that Bill Mason credits Gardner Fox as writer. I think it’s safe to assume that Fox didn’t draw it and Wood didn’t write it, so the only thing we can’t be sure of is the nature of Harrison’s involvement. My guess is that he penciled it and Wood inked it, since the art only resembles that of early ‘50s Wally Wood if you close your eyes and wish really hard. “Horror in the Night” features some art by Kurtzman that reminded me of what we saw from the pen of Ramona Fradon at DC in the ‘70s. The story is nothing to write home about. 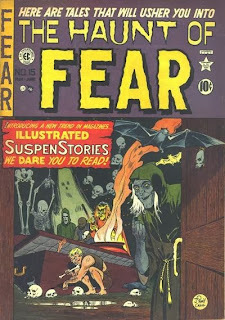 Jose: I believe this was the first pre-code horror comic book I read in its entirety, so of course it’s going to hold a deeply nostalgic place in my heart. The 14-year-old me would probably tell you that every story in VoH #12 was just dandy, and to a certain degree I think that still holds true. “Portrait in Wax” and “The Werewolf Legend” both recall the landscapes of Gothic horror cinema and literature, while “Horror in the Night” stands as one of the earliest examples of EC delivering the brutality. 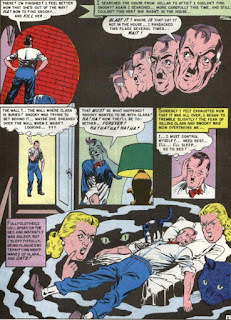 The theatrical staging of the tale (husband and wife in a hotel room with a ghostly chorus of one dreamer) keeps most of the actual violence off in the wings, but this coupled with Kurtzman’s art—which always looked like it would be better suited to more blackly comic yarns but hardly ever was in the horror titles—combine for truly disturbing effect. I remember being quite taken back by the devoutly non-supernatural terrors at the heart of the couple’s existence: insanity, the death of an infant child, suicide. Pretty hard-hitting stuff. “Terror Train” seems like a callback to the thrillers of old time radio, where wives were forever in peril of being done in by their calculating spouses. Feldstein’s script escalates quite nicely, from mild apprehension to pervasive paranoia to full-on nightmare with a train car full of corpses and death by premature burial. Yowza! Peter: After reading the entirety of Vault of Horror #12, I feel like one of those traffic cops yelling at the crowd, “Move along. Nothing to see here!” What is on display is a variety of cliches and red herrings (the cursed descendant who’s not really a werewolf but the victim of an elaborate, evil plan; a woman who believes her husband is out to kill her and is actually an escaped inmate) no better than those found in the competition at the time (and one only has to read our “Dungeons of Doom” columns to know how prevalent these old plot hooks were). Fortunately, we’re all Monday morning quarterbacks on this journey and we know, based on the evidence, that Gaines and Co. were just finding their feet on the way to something magical. On a positive note, the art here is never less than eye-catching and, in some instances, quite fetching. Kurtzman’s quirky “camera angles” and panel layouts on “Terror Train” force you to turn pages despite a script tantamount to Sominex. In a rare turnabout, the adaptation of "Horror in the Night" for HBO's Tales from the Crypt is much better than the source material. Russell (Highlander) Mulcahy directs a script that pretty much jettisons quite a bit of the VoH story other than the Groundhog Day-like plot hook. 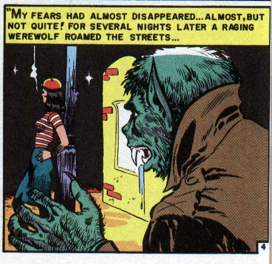 John: After complaining about the lack of werewolf in “Curse of the Full Moon!” from Crypt of Terror #17, "The Werewolf Legend" provides an example that one should be careful what they wish for. I found "Portrait in Wax" to be the most entertaining tale in this issue, perhaps thanks to the Dr. Phibes vibe of the final panels. Two issues in, and I'm still longing for the art and stories that I know will ultimately represent the best of the EC Comics tradition. HISTORY LESSON #2: VoH continued its numbering from War Against Crime, one of the better “Pre-Trend” titles (at least of the handful I’ve read), a book aimed at taking a slice from Lev Gleason’s multi-million selling, ultra-violent Crime Does Not Pay, a veritable smorgasbord of rapists, murderers, and underworld gangsters that, along with EC, helped Fred Wertham give illustrations to his theories. Like Crypt of Terror, War Against Crime featured horror stories in its last two issues (“Buried Alive” and the awful “Mummy’s Curse,” both drawn by Al Feldstein), both advertised as "From The Vault of Horror!" 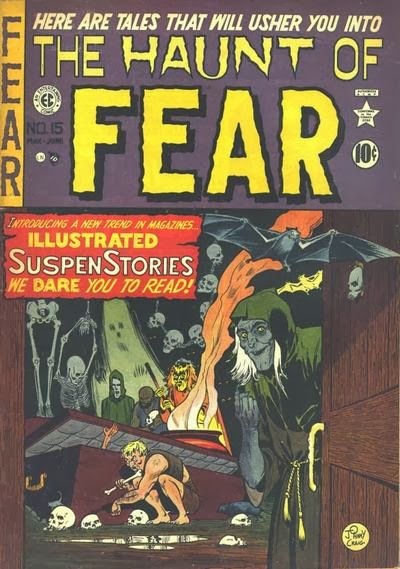 Haunt of Fear #15 has virtually the same lineup of creators in the same order as Vault of Horror #12 and, once again, Johnny Craig takes the prize for best story with the lead off tale, “The Wall,” subtitled, “A Psychological Study.” Neal Harper is a man with a problem. His wife Clara cares more for her new cat, Snooky, than she does for her husband! Tired of being sent out in the snow to fetch milk for the cat, Neal snaps and swings something (a fireplace poker?) at the cat, but he misses Snooky and accidentally kills Clara. As he thinks about how to dispose of the body, he spies a pile of bricks in the cellar and, before you can say Edgar Allan Poe, a new wall has appeared and behind it lays the body of Clara. Neal can’t find Snooky and thinks he must have walled the cat up with his wife. After a night of fitful sleep, Neal awakens and hears the cat howling. The noise drives him crazy so he knocks out a single brick from the bottom row of the wall and reaches in to grab Snooky. Instead, he feels his hand being torn to pieces by an angry feline. A couple of the boys in blue appear and knock down the wall. Snooky also appears—the cat was busy having kittens and was not behind the wall after all. Unfortunately, Neal now has to explain about his wife’s corpse. Yes, it’s derivative of Poe’s “The Black Cat” (and where do those cops come from, anyway? ), but Craig’s art is brilliant, especially the layouts which, to my eye, owe a big debt to the sort of things Will Eisner had been doing in The Spirit for about the last five years. Neal has a Hitler mustache and haircut for no apparent reason, and I still can’t figure out what object he uses to kill Clara, but this is great work overall. It’s not easy to pick one or two panels to reproduce because there are so many good ones. 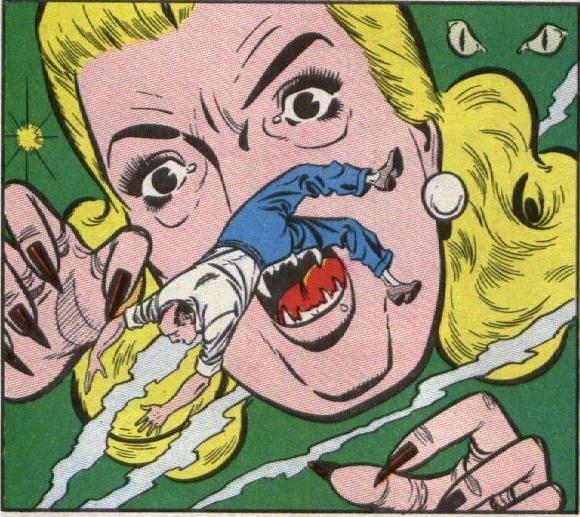 “House of Horror” at least has better Kurtzman art than “Horror in the Night,” but it’s a trite tale of a fraternity prank and a haunted house that ends without a resolution, kind of like a story from Ghosts at DC in the ‘70s. “The Mad Magician” is standard fare with nice-looking art, but the idea of a magician who really saws people in half should have led to some more gruesome sights than those we’re treated to. “The Thing in the Swamp!” should be better than it is, what with Feldstein spinning a yarn about a science experiment gone wrong and the swamp blob that resulted. As in “The Mad Magician,” the blob could be a lot more interesting. HISTORY LESSON #3: As with Crypt and Vault, Haunt continued numbering from a title that had nothing to do with the horror genre. The first four issues were devoted to the Laurel and Hardy-esque duo of Fat and Slat and then the title morphed quietly into Gunfighter (which saw 10 issues before giving way to Haunt). Peter: I thought “The Wall” would be so much better than it was but, in the end, it was simply a Cliffs Notes version of “The Black Cat,” complete with an expository just in case we don’t get that Neal Harper is eaten up with guilt for murdering his wife and only imagines the cat’s howls. So much better, to me, was “House of Horror.” While Jack didn’t appreciate its vague climax, I applaud the fact that Feldstein and Kurtzman held back, letting us imagine what Wilton saw in his final moments. It’s become a cliche to say that what we don’t see is even more frightening than what’s shown but, in this case at least, that’s true. “Mad Magician” predates the cinematic potboiler starring Vincent Price by four years and contains a fabulous psycho who has no problem sawing men in half until he gets it just right but “Thing from the Swamp” is a stinker. Funny that, just three years later, EC will send up the whole swamp creature fad in Mad #5 and hit on all the dopey notes present here. Jose: Adaptations of well-worn material can still succeed with the right amount of originality and panache, and Craig’s version of “The Black Cat” is innovative enough in the manner in which the art reflects the psychological states of its characters to be powerful in its own right. While I didn’t and still don’t consider “House of Horror” a Great Work of Art, its conclusion is unsettling in the restraint it demonstrates by not disclosing just what it was that snatched those poor fraternity pledges from this Earth and left the group’s leader a gibbering wreck. It has the ring of a classic urban legend, which is fitting as EC sourced this tale from the “Trail of the Tingling Spine” chapter in Bennett Cerf’s Try and Stop Me. “The Mad Magician,” for as neat as its gloomy seaside castle and Vincent Price-lookalike villain are, doesn’t quite do the trick for me. And call me crazy, but I have a small soft spot for ol’ Blobby from “The Thing in the Swamp.” Sure, maybe the story moves as fast as molasses in winter, but the sequence detailing the creature’s birth in the mucky swamp and its progressively elevating diet fulfilled some inner need in me to witness a ravenous protoplasm clean the slate of nature. Go figure. John: While I forgive "The Wall" for taking POE-tic license with "The Black Cat," I personally just didn't enjoy the tale as much as my fellow readers. My interest was piqued when I turned the page to "The Mad Magician"--the first tale whose art actually impressed me, though I found the overall tale lackluster. 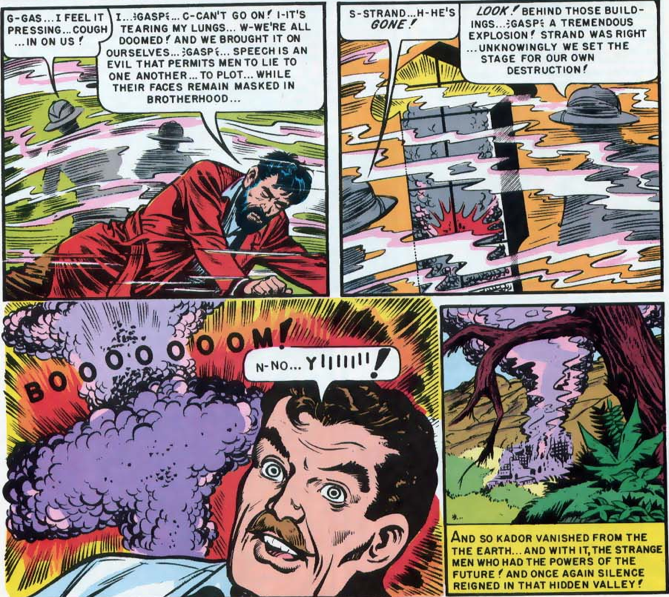 Worst of all, I was shocked to get to the last panel and read about (rather than see) our villain cut in two! This isn't the stuff of legend, that's for sure. I had higher hopes for "The Thing in the Swamp," but that's my fault for expecting more Heap/Swamp Thing/Man-Thing than Blob. 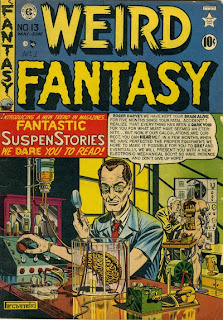 WF didn’t exactly get off to an auspicious debut with a story called “Am I Man Or Machine?” written and drawn by Al Feldstein (with a little co-authoring by Gaines), inspired by the disembodied brain stories that were the rage at the time (Curt Siodmak’s novel Donovan's Brain being the most famous example). Roger Harvey shows up at the door of his fiance Diane, who’s a little shocked to see him since he was killed in a car crash two years before. Roger explains that, though his body was killed in the accident, his brain was kept alive by two brilliant scientists in a jar of liquid. With amazing technologies, the two doctors manage to create a plastic body for Harvey’s brain (one that is, amazingly, so lifelike no one notices Harvey looks like a life-size G.I. Joe doll) and teach him how to use it. When Roger finishes his story, Diane sighs and admits that two years was a long wait and she went off looking for love elsewhere. Though she’s married, she offers to dump her husband and run away with Roger. 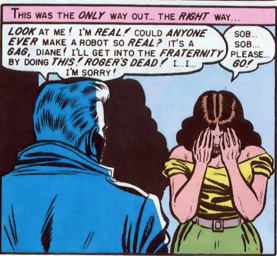 Realizing that he can’t give her the love she’ll need, he instead tells Diane that the whole story was an initiation prank and, one would think, heads off to find a window mannequin he can call his own. Of course, my warped brain wants to see the alternate ending where Roger takes Diane up on her offer and shows her just what this plastic body can do! "Am I Man or Machine?" Harry Harrison, the author of “Only Time Will Tell,” later became a major force in science fiction, authoring hundreds of novels and short stories, including four very popular SF series: The Stainless Steel Rat, the Deathworld trilogy, Bill the Galactic Hero (a hilarious spoof of SF that later became a comic book series), and Eden (intelligent dinosaurs). Harrison also wrote Make Room, Make Room! (1966), the basis for the film Soylent Green (1973). A trio of explorers stumble across the legendary Kador Valley in the lackluster "The Men of Tomorrow." The scientists discover that the villagers are mute but communicate through telepathy. 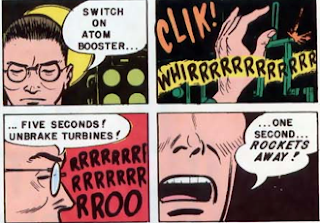 Americans being Americans, the boys can't leave well enough alone and begin teaching the primitives how to speak, an act which somehow eliminates their telepathic powers. This creates a rift between those who can talk and those who can't and, very soon, our "heroes" discover that the ancient race has discovered atomic power and how best to use it. The earliest example of an EC "preachy," "The Men of Tomorrow" sinks under the weight of its huge gobs of expository dialogue and its heavy-handed message. Teaching the savages to speak somehow introduces them to the Western culture's yen for "lying and deceit and corruption!" Obviously, the bomb was their idea long before "we" corrupted them. Of all the EC artists, Jack Kamen is the blandest and most out of place in this stellar bullpen, lacking anything approaching style or flair. His art just sits there. 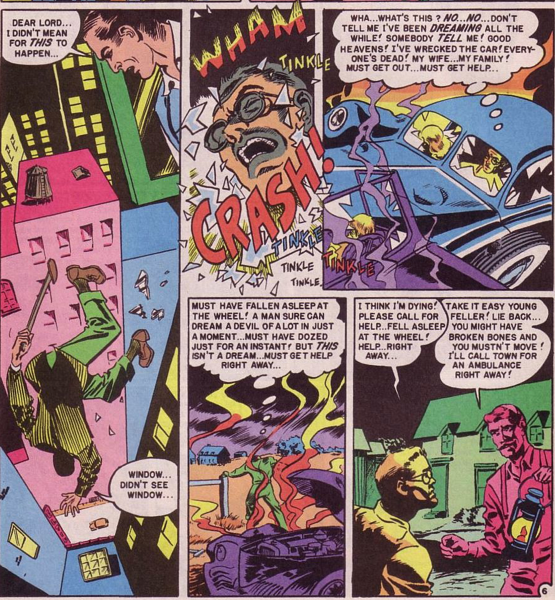 Mind you, "Men of..." is probably not the best example of Kamen's work since several of the panels (such as the hilariously crowded chase scene to the left) have so much verbiage, the drawings seem almost an afterthought. Jack: I loved “Am I Man or Machine?” It’s a great story with the best art this month (so far) from Al Feldstein and a moving story. Like the other three tales in this issue, it’s science fiction, not fantasy. Science fiction was looked down upon in 1950 and perhaps Gaines called the comic Weird Fantasy to try to avoid the negative connotations of the term science fiction. “Only Time Will Tell” is a great story as well, with hints of the Wally Wood we’ll come to love and a narrative that makes this a comic for adults—or at least mature kids. “The Men of Tomorrow” is so wordy that it’s almost a spoof and the heavy-handed tone is one we’ll see again. “ . . . Trip Into the Unknown” features decent art but was anyone surprised that the planet was Earth? I don’t think this was a new twist even in 1950. Jose: The first issue of Weird Fantasy certainly isn’t a startling debut as far as the stories are concerned, but the art from Feldstein, Wood, Kamen, and Kurtzman is certainly pretty to look at and interesting in how diverse they are from one another. The Gemstone reprints definitely complement the illustrations nicely, with crystal-clear reproductions and a vibrant color palette that pops off the page, as can be seen in the panel grabs. I agree with Jack that “Am I Man or Machine?” has some merit to it; though the laboratory scenes are a little heavy on the pseudo-scientific exposition, the script hedges into some darkly philosophical territory when Roger encounters an empty—and by extension, godless—universe upon his moment of death. Can I admit here that I was left scratching my head during “Only Time Will Tell”? I don’t think it was the fault of the script at all, but for some reason I got lost amidst all the paradoxical ruminations. The other two stories are nowhere near as intriguing. 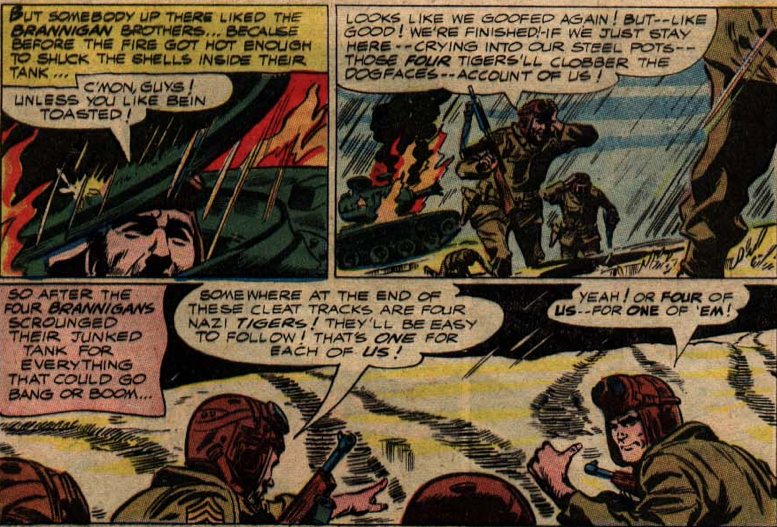 “The Men of Tomorrow” reads like an action-starved travelogue before it decides to pep things up with an explosion (it doesn’t help). And I would like to think that “…Trip Into the Unknown” was Gaines’ and Feldstein’s way of saying "Well, we got the ‘It was Earth the whole time’ chestnut done and over with it…" but as Harry Harrison would say, only time will tell us for sure. HISTORY LESSON #4: No one even turned their head when EC Comics’ Moon Girl became A Moon, A Girl... Romance with its ninth issue in 1949 and, if we’re to believe William M. Gaines, EC’s publisher, not many more noticed when that title was dropped for the catchier Weird Fantasy in 1950. Moon Girl featured the title super heroine created by Sheldon Moldoff and written by Gardner Fox, while A Moon, A Girl... was stocked with love stories with titles like “I Was Jilted and Had No Desire to Live” (written by Al Feldstein), “I Thought I Loved My Boss” (art by Wally Wood), and “Hearts Along the Ski Trail” (also by Wood). Moon Girl’s real claim to fame is that it featured EC’s first horror story, “Zombie Terror” in issue 5 (by Johnny Craig). So, lost in a sea of romance titles, A Moon, A Girl... gives way to EC’s first science fiction anthology title (well, technically it’s tied for first since the premiere issue of Weird Science appeared the same month). Lab assistant Karl, visibly shaken, relates his tale of incomprehensible woe to a psychiatrist. It all began in the workshop of the brilliant Professor Einstadt, a genius who discovered a chemical compound that, once administered to a test subject in the form of a breezy coat of pressurized gas, could shrink any object down to microscopic level. But here’s the kicker: the subject is doomed to shrink to ever-tinier proportions indefinitely. Too bad that Karl, inexperienced in the maintenance of the professor’s equipment, accidentally douses himself in the mist. Einstadt is horrified to find his shrunken assistant upon his return and, seeing no other way to help him, applies the gas to a revolver so that Karl may defend himself and, if necessary, take his own life. Soon Karl has sunken into the sweat glands of the professor’s hands with no time to consider his incredible plight as he’s attacked by hungry corpuscles. And so it goes, Karl shrinking and shrinking all the way to subatomic levels, discovering universes hidden within the cells of the professor’s being and the galaxies within those. Karl attempts to land himself on nearby planets and beseech help, but when he isn’t being understood by the indigenous peoples he is inadvertently bringing destruction to their world. Finally reaching a realm where his language is understood, Karl laments to the psychiatrist that even the doctor’s ignorant world is ill-prepared to find a solution for his malady. Shrinking from sight, Karl leaves the mystified therapist pondering the possibility of there being worlds within Earth and civilizations more advanced than that of the United States in which he lives. While readers of science fiction will undoubtedly be reminded of Richard Matheson’s seminal The Incredible Shrinking Man, “Lost in the Microcosm” takes the main adventure of that story and runs with it well past the conclusion of Matheson’s novel. Karl’s wonder and godlike playfulness at discovering the swirling cosmos within cells within cells is palpable through Kurtzman’s art, with compositions that range from the absurd (Karl wiping out a city with a tsunami induced by his sneezing) to the awe-inspiring (the wordless panels of Karl staring into starry space and kneeling on a planet’s horizon like a felled Colossus). It’s positively mind-expanding, one of the trippiest excursions into the land of graphic speculative fiction ever committed to print. 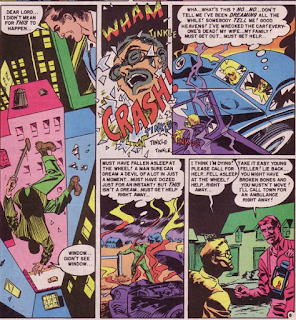 The Harry Harrison-scripted and drawn (with inks from Wally Wood) “Dream of Doom” can’t help but suffer, not only from its old hash storyline but from the fact that it seems like a glaring rip-off when placed right next to “…Microcosm.” The narrator here is basically going through the exact same thing as Karl, with subatomic hijinks here substituted with a mixed-up river of dreams. There’s no sense of discovery or change in “Dream of Doom” though; our benighted hero simply goes from one fantasy to the next ad infinitum, never changing his course or doing anything besides saying “Ahh, surely this must be reality!” Keep your eyes peeled for comics publisher “Gill Baines”! Peter mentions Kamen’s stiff, cookie-cutter art above and, while I think ol’ Jack had his chance to shine in different assignments, this is certainly one of his more by-the-numbers pieces. Hilariously, Feldstein insists on having the two scientists address each other by name in almost every panel, as if it were important to keep reminding us what great chums they are. The turnabout at the tale’s conclusion is pretty neat, predating Flowers for Algernon in its own way, as assistant Henry discovers that any subject who crosses over death’s threshold for fifteen minutes is sure to return to life a raving maniac. The individual pieces of the story show some promise, but when cobbled together I can’t help but feel that there’s some integral spark missing from this experiment. Jack: This is a great comic but it’s the weakest of the five we read for this post. Why do all of the stories seem familiar? Were these ideas ones that had been explored in science fiction pulps prior to 1950? They certainly went on to be the subject of books, movies and TV shows in the decades that followed. Did Richard Matheson read “Lost in the Microcosm”? 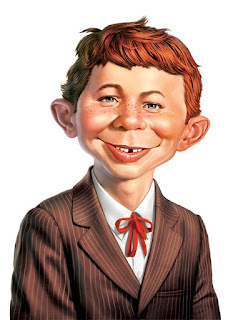 Did Rod Serling read “Dream of Doom” and “ 'Things' From Outer Space”? I doubt it, but the themes and images are very familiar to those of us who grew up watching The Twilight Zone! 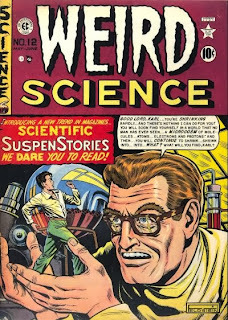 Of the four stories in this issue, I liked “Experiment . . . in Death” best because I did not know what was coming next. John: As the resident bare•bones Matheson-junkie, I found "Lost in the Microcosm" particularly interesting. The story itself seems to take a page out of H.G. 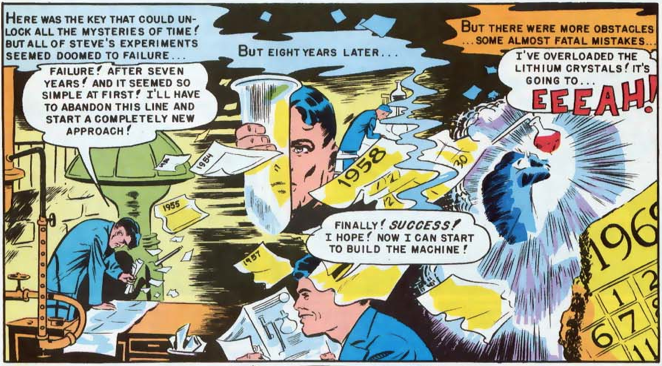 Wells' The Time Machine as the story starts off with a disheveled Karl telling his story to another professor. While it does predate The Shrinking Man by 6 years, as fellow prof Jose points out, Matheson's novel ends where this story really takes off. I did find it amusing that Professor Einstadt's first instinct was to offer Karl a revolver (which we see him fire six times in the course of the story... I was waiting to see if he'd end up using more bullets than would have been in the gun!). And it was a particularly creepy turn to have Karl end up in the Professor's pores. I guess if you spent enough time looking through a microscope, you might feel comfortable facing blood cells as big as you. All in all a fun exercise exploring the nature of the universe. HISTORY LESSON #5: Three titles gave life to Weird Science: Happy Houlihans (2 issues), Saddle Justice (6), and Saddle Romance (3). I’d love to read a book focusing on all the EC “Pre-Trend” titles like those listed but I sure wouldn’t want to write it, based on the few issues I’ve read. 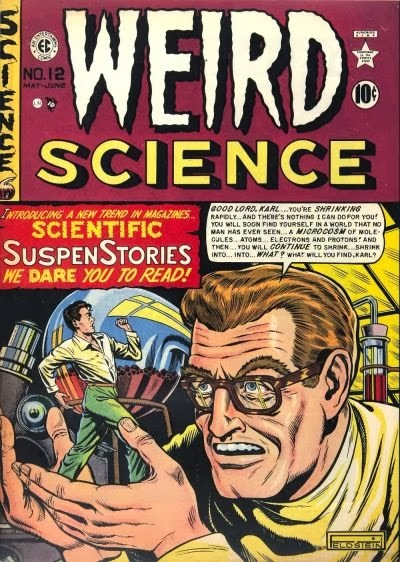 Peter: The problem I have with the early issues of Weird Science (and, to a lesser extent, Weird Fantasy) is that many of the stories included within its covers feel like they’ve been written by someone who was just gifted a twenty-volume set of How The Universe Works. Eventually, Gaines and his staff of writers will grow out of that and remember that it’s the plot that drives these little fables and not the gizmos. “Lost in a Microcosm” and “Dream of Death” are pretty much the same story (man shrinks and keeps seeing new worlds vs. man keeps falling asleep and waking up in new situations) but “Dream” is a bit more entertaining thanks to Wally and it introduces a gimmick that will get a lot of mileage in the EC funny books: the artist and writer as character. “‘Things” is a predictable bit of fluff but “Experiment… in Death” has a great plot hook that predates Stephen King’s Pet Sematary by three decades. 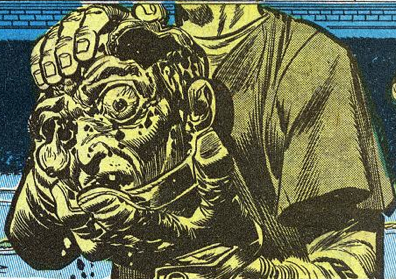 With a genuinely nasty climax, “Experiment” is easily the best story in the first issue. Gentleman Gene Does It Again!